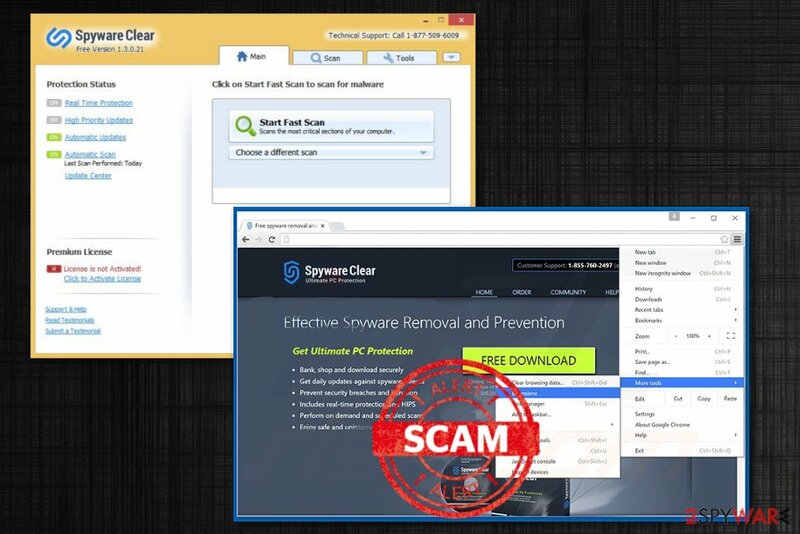 Spyware Clear is the PUP that uses misleading techniques to prevent removal. Use Reimage to locate malicious components and get rid of them faster than with uninstall instructions. A full system scan blocks virus reappearance and prevents traffic to malicious domains. 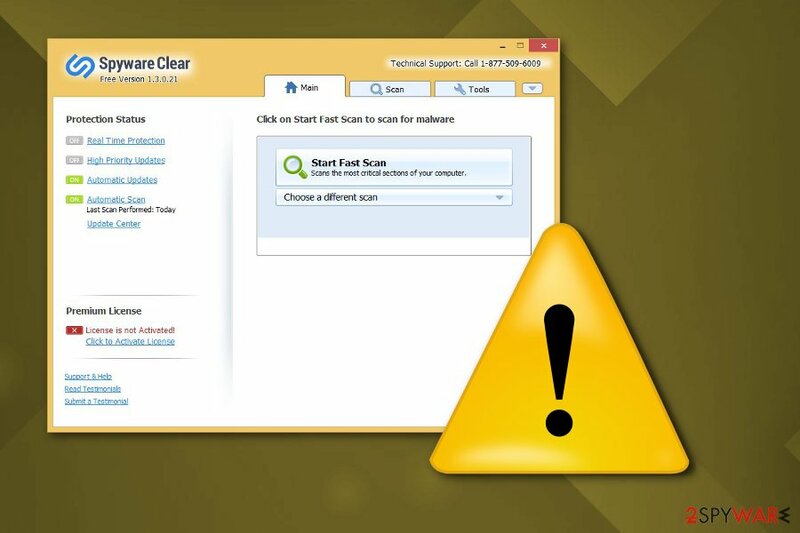 Spyware Clear – yet another PUP that pretends to make your system more secure. This toolkit allegedly removes spyware and protects users from various infections. It may seem legitimate and attractive, but there is no doubt that this is just an intrusive program that can provide nothing positive. The main thing that it seeks is the money which is collected by convincing users to buy the full version. However, we seriously doubt program's (trial and fill version) capabilities to detect all viruses and malware. Beware that you may receive overreacting scan results from Spyware Clear reporting about safe programs, harmless files and meaningless entries. While this program itself is not harmful, its presence is more than annoying. There are tons of this type of programs offering features like improved computer's performance and security, increased search quality or even weather updates and similar information provided right on your desktop. While in most of the cases these claims are true, it cannot be said about Spyware Clear. Right after being installed on the system, this app starts interrupting you with continuous system scanners and reports stating that there are different problems detected. Additionally, the app starts pushing you into thinking that the only way to solve them is to install the so-called full version. Unfortunately, we do NOT recommend spending your money on such questionable tools. 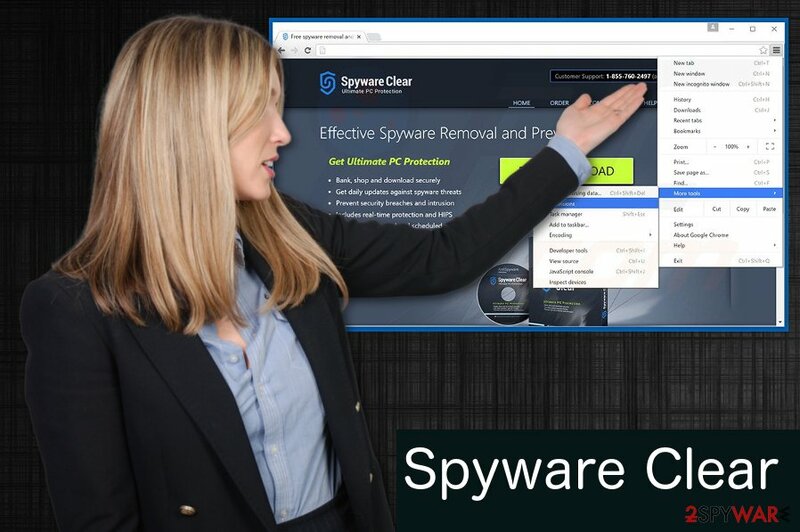 You should better remove Spyware Clear from the system and check it with Reimage or other reliable software which is capable of removing adware, browser hijackers and similar programs. Besides, this program may start bothering you with its aggressive ads offering you to purchase the same licensed version that is supposedly needed for fixing your computer. According to people who have already installed it, sometimes they can hardly use their computers and browse the web because of Spyware Clear ads. Before you enter your credit card details, you should think twice and think whether it is worth it or not. It may be that you will spend your money on nothing or on a program that is suspicious. search for deals, offers or sales. These information-tracking applications do no damage to your system, but it can attract other more malicious software and viruses. Also, this information might be used by third-party. Most of the times this data is used by commercial content providers. They can generate advertisements based on your search history and tendencies to click on certain ads and offers. You may download it from several download sites that claim that it is capable of protecting the computer and fixing all issues that can be found on it. However, in most of the cases, it appears on computers after downloading third-party programs on them. Please, be very careful when downloading questionable programs on your computer. If you see that program is suspicious, you should look for other people’s reviews and comments about it. The more time adware spent on your browser and computer system more advertisements you can get any more information about you is collected. You need to focus on Spyware Clear removal as soon as you notice anything suspicious. The best way for this kind of programs is the anti-malware tools like Reimage. Cybersecurity specialists at Virusai.lt advise you to be more cautious while browsing online and installing software or updating tools. Virus developers and developers of suspicious computer tools have been actively using bundling technique that is designed to hide PUPs in software bundles. During the installation process, especially when downloading software from questionable websites, you can get additional pieces of malware, like adware, hijackers and similar apps. These programs can easily make your system prone to other cyber infections, so there is no doubt that you need to stay away from them. To avoid these apps, choose an Advanced or Custom installation option each time you download freeware from the Internet. This will help you unpack software bundles and reveal every little piece of malware trying to infiltrate your computer without your approval. Make sure you de-select any additional pieces that seem suspicious at this point. To remove Spyware Clear from the system, you should use steps that are given below. It is not a virus, so you should find it in your Task Manager. Make sure you uninstall its entries and then run a full system scan with professional anti-malware or anti-spyware program to make sure that it is virus-free. This tool claims to be antispyware optimization tool but can hardly provide useful features. There is a plenty of programs that are worth purchasing. Here, look for Spyware Clear or any other recently installed suspicious programs. ^ Chris Hoffman. What is PUP?. How to geek. Online tech magazine. ^ Virusai. Virusai. Spyware news. This entry was posted on 2018-06-22 at 05:53 and is filed under System tools, Viruses. You can quickly scan the QR code with your mobile device and have Spyware Clear manual removal instructions right in your pocket. How did you remove Spyware Clear?